Ferdinand's Cheese Curds from Foundry Kitchen & Cocktails. With only eight miles between them, Moscow and Pullman share a lot of things. People, business, a really great bike path... and food. Putting together the most perfect meal is a challenge, with the added pressure of one eater attempting to represent an entire community. It's impossible — too many combinations, too much good food. But it is a delicious challenge to attempt. As a food writer living in Pullman, I have the pleasure of knowing many more farmers than chefs, so elements like sourcing matter to me. I want my perfect meal to feel like more than a blend of two college towns. I want the Palouse version of old favorites. I also eat out infrequently so that, when I do, I can choose to pay a little more for a pizza with red sauce made from locally grown tomatoes. But then again, I want a pizza with red sauce that is not topped with pears, so my palate is traditional. I like things that are simple and familiar with a touch of something unexpected. My perfect meal makes me believe I'm a foodie, just as long as I don't compare it to anyone else's. But that's what makes it perfect — it suits me: my taste and my preference for what's casual yet special. Hunga Dunga is the newest brewery to open on the Palouse. It's small, with just a handful of brews on tap, ranging from a citrus wheat to a double IPA. The Red Rye stands out to me for its blend of hop and malt flavors. It's very middle-of-the-road in terms of bitterness, so it pairs well with a meal while maintaining its own character. 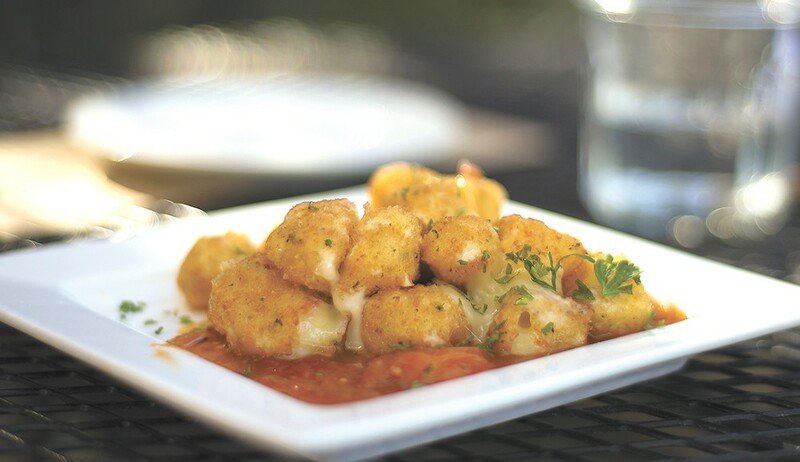 Sure, there are classier options for appetizers, but what you don't know is that these cheese curds require a fork. Crispy, golden breading and a slight jalapeño kick make this dish a major step up from what you'd get at a fair. And, please, put any thought of dry, over-breaded fast-food cheese curds far from your thoughts. These have that buttery, melt-in-your mouth quality that makes them irresistible — a key factor for any fried-cheese dish that you must eat before it cools. In Pullman, it's practically mandatory for a restaurant to serve Cougar Cheese made at Washington State University's creamery. Foundry's ode is served on a thin, tomato-based sauce, aka a homemade marinara. See what I mean? Simple and familiar, yet special. Maialina's brick-oven pizza may look like the same pie you can get at any of the many, cheaper pizza places that have taken off, but it's just better. And if you go after 9 pm, pizza is half-price, putting it about even with fast-casual establishments. The Parma is piled high with arugula, salty prosciutto, and shaved Parmesan on top of a homemade tomato sauce and sliced — not shredded — house mozzarella. It's surprisingly filling (hardly suited for a three-course meal, but it's what dreams are made of). I adore personal-size pizzas because my date always wants pepperoni, and while I love a good meaty pizza, it feels like a luxury to order one covered in leaves and thinly sliced salted pork. To me, the local purveyors' board is the highlight of Maialina. Carly Lilly, who co-owns the restaurant, is a force in local food on the Palouse. She's invested in farms to help them scale up production to sell more local produce, meat and eggs to Maialina and its sister, Sangria. She says there's nothing convenient about using the farmers market or coordinating with several growers to supply all the ingredients needed at the two restaurants each week, but supporting local people who grow food is worth the logistical hurdles.